Since the 19th Century a Cabanon (cottage) has occupied the site of the current house in what was then known as La Famorane. The owner would visit by carriage from the village on Sundays to enjoy the spectacular views to the sea and the stunning local surroundings from a place of tranquility. The present main house, in Provencal Mas style, was constructed in the 1990s and has recently been the subject of a total renovation which has created a truly stunning modern house. The property extends to two further cottages. The larger cottage on the same level as the main house has been substantially rebuilt to provide an excellent separate guest suite. The smaller cottage on a level below the main house, with its original stone construction, has retained many of its original features during the development. Set in eight and a half acres of secluded grounds, and located at the end of its own long drive about 1 km from the village of La Garde Freinet the house sleeps ten people in five double bedrooms all of which have en suite wet-room style shower-rooms. The house has recently been refurbished to a high standard with wooden wide plank flooring throughout all living areas and bedrooms, contemporary lighting and bathroom fittings. The interior design throughout combines antique artefacts with modern style to provide elegance and comfort. From the drive the house is accessed along a charming path, across a Zen like terrace, past a pond with goldfish. Living Areas and Bedrooms are provided with Flat Screen Televisions with Sky Boxes (Freeview) and DVD players and access to Wireless Broadband. The house benefits from permanent resident staff who have been chosen to provide a discreet service and to present the property to the highest standards whilst not affecting the privacy of the guests. On a daily basis they prepare and clean the house and maintain the pool, terraces and garden. Set in eight and a half acres of secluded grounds, and located at the end of its own long drive about 1 km from the village of La Garde Freinet. From the drive the house is accessed along a charming path, across a Zen like terrace, past a pond with goldfish. There are three large terraces all with stunning views to the South. The Zen Terrace is at the east end of the House where ten guests can sit and dine at a table created from a hewn rock in the shade of the overhanging Mulberry tree. To the west there is a covered terrace with comfortable armchairs around a fireplace and beyond this linking the house to the Large Cottage a newly constructed terrace in local stone with seating for twelve around a glass table and a beautiful stone barbecue. All perfect for outside entertaining. The extensive grounds with various terraced levels and olive groves also include a heated swimming pool of eleven meters by five meters set about a minute's walk from the house, approached by a winding stone staircase, which leads to the pool and surrounding area immediately below a natural rock outcrop. The black swimming pool continues the Zen theme of the upper levels and the house. The views to the Bay of St Tropez from this terrace are unrivaled. The pool has a deep end of around 2m and a shallow end of around 1m and it benefits from sun all day, although you may have to move your sunbeds around in the afternoon to remain in it. The house has recently been refurbished to a high standard with wooden wide plank flooring throughout all living areas and bedrooms, contemporary lighting and bathroom fittings. The interior design throughout combines antique artefacts with modern style to provide elegance and comfort. The house sleeps ten people in five double bedrooms all of which have en suite wet-room style shower-rooms. 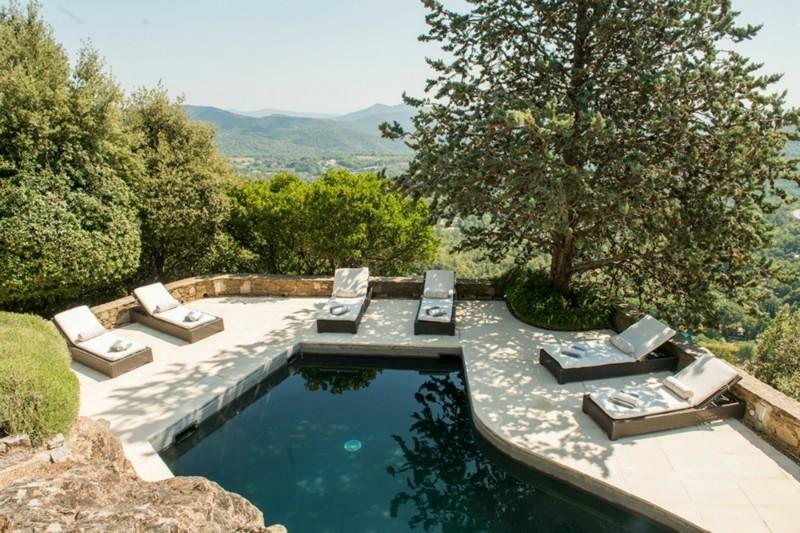 Set in eight and a half acres of secluded grounds, and located at the end of its own long drive about 1 km from the village of La Garde Freinet which would be around a 10 minute walk and Grimaud which is a 7 minute drive. The house benefits from permanent staff resident in a separate accommodation on the property who have been chosen to provide a discreet service and to present the property to the highest standards whilst not affecting the privacy of the guests. On a daily basis they lay up breakfast service (at a time which is convenient to guests), clear away afterwards and clean the house, again at a time to suit guests. They are very discreet and work around guests. They also set up all the terraces each morning and work in the garden during the day and clear up the terraces and the pool area each evening. Bedlinen is changed once per week. If this is required more frequently we reserve the right to charge an additional supplement. There is available a Donzi 22 ZX which is moored in Port Grimaud, 15 minutes drive from the house. The boat is £340 per day plus fuel and skipper charge if required. the skipper is qualified water ski instructor as well. The boat is available for hire from 1st June until 31st August.